Batman, Superman & Wonder Woman are the 3 leading characters that truly represent the Golden Age of comic books. Superman was introduced in Action Comics #1 in 1938. Tied with one other issue as the best existing copy, we sold a CGC 9.0 W for 3.2 million dollars three years ago. The ultimate buyer of the book turned out to be a billionaire from Lebanon whose father was once the prime minister of the country. In fact, he once proudly displayed an incredible comic book collection dubbed "The Impossible Collection" at the movie premiere of Batman v. Superman in London, England. It was revealed there, that not only did he own the copy we sold, he also owns the Nicholas Cage copy (CGC 9.0 C/OW) that sold for $2.1 million dollars in 2011. Subsequently adding to his collection, the superior 9.0 white page copy for 3.2 million a mere 3 years later. It should be noted that the underbidder of that auction reached out immediately after the auction and stated that if the winning bidder changes their mind, that they would definitely take it. With a high profile, one of a kind sale such as this, the book is worth what a person is willing to sell it for, and what a person is willing to pay for it. So why would a person who has more than enough money part with the best-known copy of the 1st appearance of Superman? This is the beauty of owning the very best of the best. For the next buyer who "must" have it, they would need to offer an insane amount of money in order to get the owner to even consider selling the book. Would he take 5 million? Probably not. It would most likely take an excess of 10 million to get his attention, and that is if he even wanted to sell it. How do you place a price on something that is unavailable? As we examine Detective Comics #27 – first appearance of Batman, the nicest existing copy grades out even higher than Action #1. It is a CGC 9.2 and ranks as the single highest graded copy. It has never publicly traded hands and rumor has it, the owner of it also does not need the money and is not interested in selling it. So, once again how much would a person have to spend in order to buy that book? 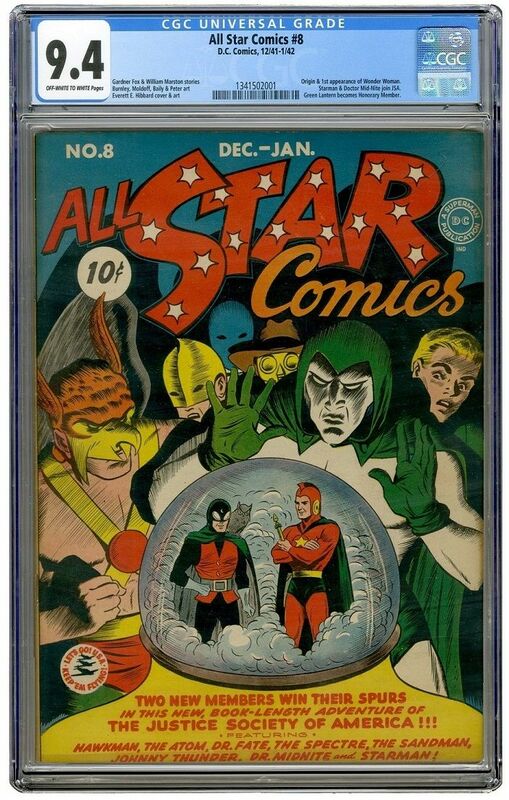 Which leads us to this book, All Star Comics #8, graded CGC 9.4 OW/W. This is an incredible and quite possibly legitimate, once in a lifetime opportunity. 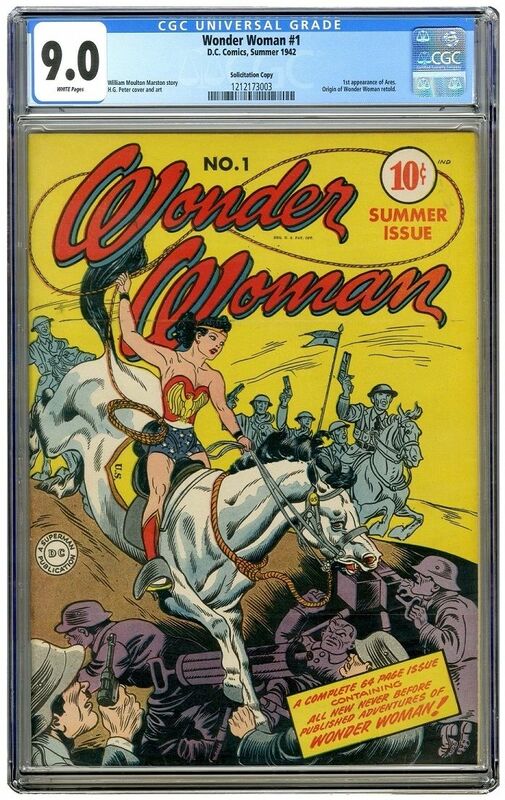 Ebay proudly presents the HIGHEST GRADED piece of the Golden Age Trinity, the SINGLE HIGHEST GRADED COPY in the world of the very first appearance of Wonder Woman- All Star comics #8! Like the first appearance of Superman and Batman before it, this could very well be the only chance you may have to ever own this book. One thing is certain, whoever purchases this book can lay claim to owning the highest graded copy of one of the biggest 3 comic books in the industry! Whoever wins this book will also own a unique piece of comic book history in that these three characters are the only Golden Age superheroes to have continuous running comic book series from their inception to present each now crossing the 75-year landmark. In addition, Wonder Woman is the only female character from that era to do so. These three Golden Age characters are also some of the only ones successful enough to have a television series. They were so successful, in fact that the three lead actors were typecast, and forever identified with their comic book alter egos, (George Reeves, Adam West, and Lynda Carter). The success of the 1950’s Superman show gave birth to the parody of Batman in the 1960’s, on a campy TV show in which many Hollywood actors wanted to get a guest spot or even a cameo on it. While Wonder Woman in the 1970’s led to other female characters such as The Bionic Woman and inspired women and young girls alike everywhere. Like the introduction to the character, women who watched that show felt empowered and motivated during a very busy era of the women’s rights movement. Wonder Woman isn't just one of the biggest three Golden Age characters, but an icon for rights and inspiration. This emotional chord has never been more on display than last month when Gal Gadot's portrayal of the character hit big screens, shattering box office records, much to emotional applause and admiration, with a sequel already announced and her next appearance in this year’s Justice League movie. When the character was originally created, she stood out as a role model for women everywhere among the male powers of Batman and Superman. There is a distinct difference between Wonder Woman and her counterparts. Not only was her original costume controversial, but she is also unique in that the success of her character defied the odds. Most readers where males, the workforce was dominated by males, as were leading positions of authority within our government and industry. She managed to succeed and truly has become the blueprint, and the gold standard of all female superhero characters that have been developed since. In today's comic book market, it is estimated that 50 percent or more of the readers are female. And quite possibly, in the not too distant future, it is feasible that the first appearance of Wonder Woman could exceed the value of the first appearance of Superman or Batman. As society progresses and we get further and further from the suppression of women, this book will be viewed as more than what it currently is, the origin and first appearance of Wonder Woman in a comic book, but perhaps also a piece of American history. This may be the only opportunity you ever have at owning this iconic piece. Like the Action Comics #1, whoever wins this book is going to be very serious about keeping it. And rest assured, should they ever decide to sell, it will probably be at multiple times the amount they paid for it in this very auction. So, if you are really serious about owning this Iconic piece, this would be the time to reasonably justify bidding higher than you normally would. With the price you pay today, it gives you bragging rights to own the only copy in existence, and to name your price tomorrow. With less volatility than stocks, this book only has one direction to go! Up! Golden Age first appearances represent the upper echelon of comic book investments. In addition, comic book investments as a category drastically lag behind their counterparts, such as art, in which relatively unknown pieces to the public can sell for 100+ million dollars Or a Ming dynasty vase that could fetch 60-70 million dollars. Or in today's headlines where a bag of moon dust sells for nearly 2 million dollars. Comic book categories are in their infancy when you consider their popularity and their role in American pop culture, and the massive commercials for them in the form of full feature movies that Americans and the world drastically crave. One of the most significant comic books of the Golden Age is now up for auction. AND it is the single highest graded copy! Sensation Comics #1 grade 9.6! This not only features Wonder Woman in her very first cover appearance, but the first appearance of two DC heroes: Wildcat and Mr. Terrific. Both Wildcat and Mr. Terrific have been featured on the successful CW TV show Arrow, now in its 6th season. In fact, Mr. Terrific is now part of Green Arrow's team. However, the rightful star of this title is the Amazing Amazon herself- Wonder Woman. Alongside Superman and Batman, she is one of the most famous and recognized comic book heroes of all time! These three flagship characters make up DC's Trinity, and are the only heroes to be published consistently since the very first time they wowed readers on the newsstand. Wonder Woman, of course is the only female hero who can lay claim to surviving and thriving with DC's top 2 males, and she was the prototype for all female heroes that followed. Making a big splash on the cover of Sensation Comics #1, hitting newsstands within 15 days of All Star Comics #8 (On sale date October 23, 1941). 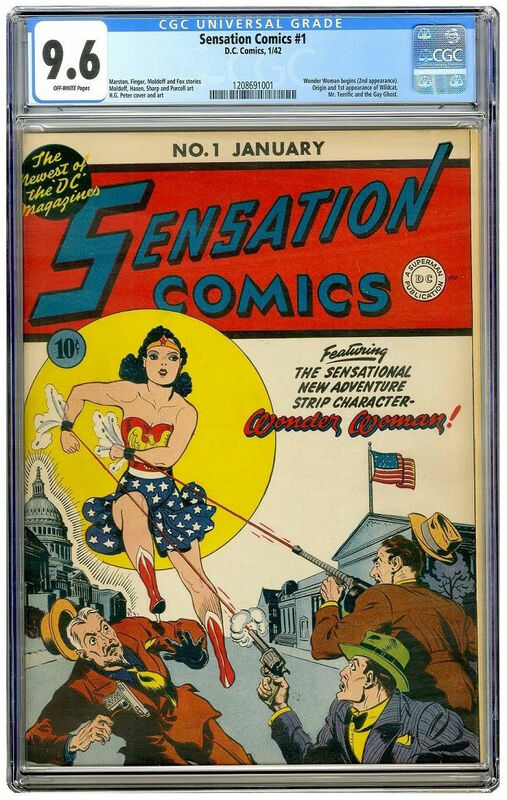 Like her peers, Batman & Superman, Wonder Woman would headline two DC titles simultaneously beginning with Sensation Comics #1. Always a symbol of female empowerment and progressive thinking, Wonder Woman has become the premiere female superhero spanning all media: comics, cartoons, prime-time TV, and just recently, the silver screen of Hollywood. Far surpassing all expectations, Gal Gadot's stunning portrayal of Wonder Woman impressed fans and critic's alike while single-handedly elevating DC's future movie horizons. This beautiful issue features her own "Action Comics #1 moment" in the form of an iconic introductory splash cover showcasing a scantily clad Wonder Woman appearing to jump out of the cover as she deflects bullets with her infamous bracelets, and like Superman's iconic Splash Cover, also ranks as one of the most recognizable comic book covers of all time. T-shirts, posters, lunch boxes, coloring books and toys have all featured this famous image. Sensation Comics #1 features Wonder Woman taking Steve Trevor home to America in her invisible jet (1st Appearance) and features the Origin & 1st appearance of her Dianna Price secret identity. Written by Dr. William Moulton Marsten, her creator and featuring excellent artwork by H.G. Peter, the issue also boasts work by two Golden Age greats, Gardener Fox and Sheldon Moldoff. To find a book 75 years old and in this remarkable condition is an outright scarcity. But to find a key Wonder Woman book this old and in this condition is nearly unfathomable. This is a wonderful, once in a lifetime opportunity to own a significant piece of pop culture, and a chance to own the single highest graded copy in the world of this historic key issue. When DC Comics launched the very first female superhero to have her own solo comic book, they pulled no punches in making her a stunning success. And success is what they achieved, financially and historically. They presented an amazing amazon icon, part Greek warrior, part feminist, part symbol of empowerment, combined with some eye candy, all to create a lasting addition to the comic book world that has been published consistently for the last 75 years, a feat only equaled by Superman and Batman. Dc tried her out on readers twice, first as a back up feature in All Star Comics #8, and then with a cover feature in Sensation Comics #1. It was then time to award her own book in the summer of 1942 with Wonder Woman #1. This issue featured not only her origin story and 3 more stories of Golden Age heroics. The buzz has only multiplied with the smashing box office success of the Gal Gadot solo Wonder Woman movie. Beloved by moviegoers, comic geeks, and critics alike, DC finally has a motion picture hit on its hands to rival the Christopher Nolan Dark Knight movies. This hype will only increase the value of this book. DC made unprecedented moves in selling Wonder Woman to the wartime public in 1942. First, they ditched the musclebound, he-man prototype that performed amazing feats that young boys could only dream of, and introduced something else entirely. A powerful feminist, first and foremost, she also displayed an abundance of intelligence, patriotism, and beauty. Created by Dr. William Moulton Marston, a Harvard psychologist newly famous for his polygraph invention, the hero created an ideal that young girls could look up to, and that young boys would respect. The original press release from DC (then All-American) Associate Editor Alice Marble announcing the Amazon princess receiving a solo book. An original photo of Marble reading the first issue. Also included is a press release sent to the editor of Harper's magazine dated July 22, 1942, emphasizing the importance of comic books on American youth and how a female hero, already popular, is receiving her own book. The set also includes a small card asking publishers which historic female they should feature next in their "Wonder Women of History" series, following Florence Nightingale and Clara Barton. Lastly, a copy of Dr. Marsten's essay Women: Servants For Civilization. Collectible ephemera like this was not meant to last and calling it rare is a vast understatement. These, the only copies in existence, and are not just for comic aficionados, but for historians everywhere. The rarity, current demand, historical significance, condition, as well as inclusiveness of this auction lot makes this truly a once in a lifetime auction. Like the All Star Comics # 8 CGC 9.4 and the Sensation Comics #1 CGC 9.6 The auction of this Copy provides you a very rare opportunity. This very well may be the ONLY chance you ever have at owning this book. Whomever wins this auction will truly be in the enviable position of having full control and ownership of this book and IF they should ever decide to part with it, would undoubtedly seek far more than today's final hammer price. To the deep pocketed collector, money alone is not a reason to sell, and If that is the case, then this truly is.... the only chance you will ever have at owning this book. It is my distinct honor and privilege to auction off: THE MOST DOCUMENTED & HIGHEST GRADED COPY OF WONDER WOMAN #1 IN THE WORLD ! !